It’s time for us to collect beer scores again. These will be used, in November, to compile the hit list of pubs that will be considered for entry into the 2019 CAMRA Good Beer Guide. Never done a beer score? - This is your chance to provide a view on the beer quality in the pubs you visit over the next 8 months and contribute to the process of selecting of pubs for the next Good Beer Guide. The more members that contribute then the more accurate the end result, so please don't just leave it to others. 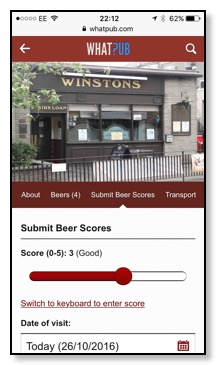 Just a few scores for your local pubs would be a great help, especially if you live outwith central Edinburgh. See the Beer Scoring page for more information on how to submit beer scores.